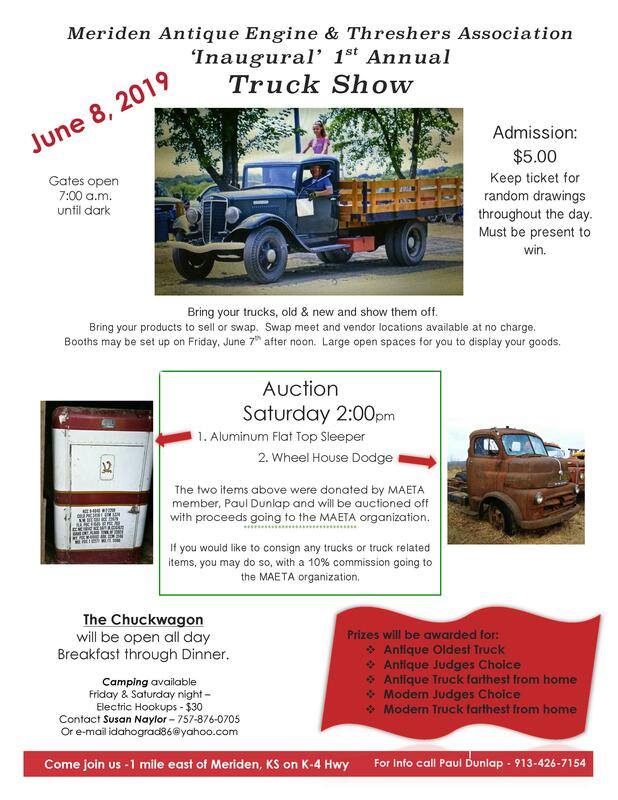 The Meriden Antique Engine and Threshers Association is a non-profit organization based in Meriden, Kansas. We were founded in 1977 to promote early farming practices and an appreciation for antique engines and tractors. We love to farm the old fashioned way! We want to pass on the techniques used in the past so we don't forget them. We also love to play with old tractors and old engines. And we want to pass that knowledge on as well. As a 501(c)(3) organization, your contributions are tax-deductible. Yolanda Dickinson is the new editor of the newsletter. You can contact her with suggestions or to request a paper copy in the mail. ydickinson1914@gmail.com . Our next show is June 8!! 2019 Truck Show flyer is here!!! Congratulations to Mary Herring, Valley Falls, who won the Ford Tractor Quilt! See our Facebook page for pictures and videos from the 2018 Threshing Show and Fall Festival! We have lost our printer and are currently trying to find a new one. Because of this, we are probably not going to mail a paper copy this year. Contact editor Gary Bowen with newsletter suggestions and questions. garybo.44@gmail.com . Congratulations to Taegan Winter, Valley Falls, who won the Oliver Tractor Quilt. Deanna Halbert, who resides in both Alaska and Westmoreland, Ks., won the crocheted bedspread. See our Facebook page for pictures and videos from the 2017 Threshing Show and Fall Festival! 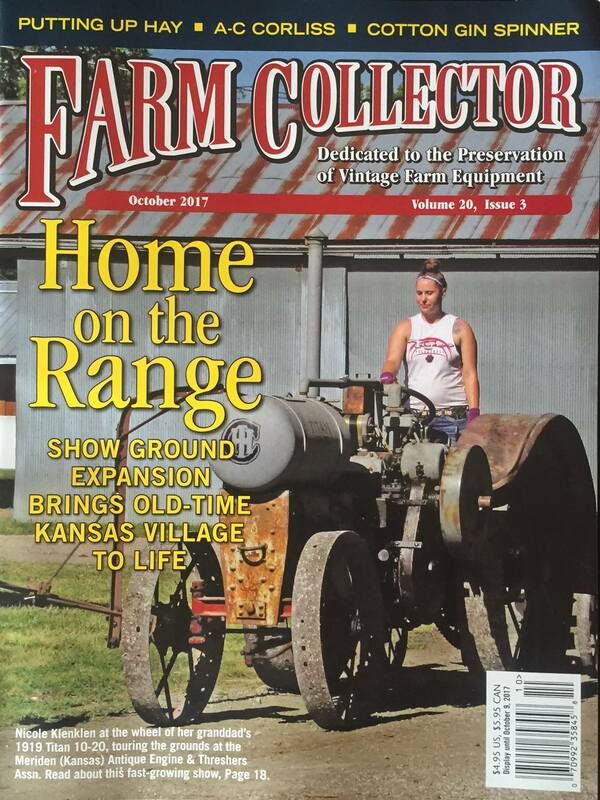 Did you see the October 2017 issue of Farm Collector Magazine? We made the cover!!!! Click on the picture to go the story. Please note: Due to scheduling conflicts, the date for the 2017 Summer Show is July 14, 15, 16. It is incorrect in the newsletter. After a several year hiatus, the newsletter is back! Contact editor Gary Bowen with suggestions and questions. If you would like a paper copy, you may contact Gary via e-mail: garybo.44@gmail.com . Congratulations to Chris Claiborne, Berryton, who won the John Deere Wedding Ring Quilt. Troy Smith, Topeka, was the winner of the Cedar Chest. See our Facebook page for pictures and videos from the 2016 Threshing Show and Fall Festival! Did you get a copy of our 2015 Newsletter? Its been a few years since we have published the newsletter. Editor Gary Bowen is working on the 2016 edition now. If you would like a paper copy, you may contact Gary via e-mail: garybo.44@gmail.com . Would you like to have your wedding or other party at our grounds? Please contact Jody Kirkwood at (785) 484-3713. Our 2015 Summer Threshing Show was one of our biggest shows! The Fall Festival was terrific as well! Our 2015 Tractor of the Year was Case. Please visit our Facebook page for pictures and details. Copies of the Case panorama photo are $35 and may be purchased from Kevin Kirkwood at 785-220-9477. Our 2014 Summer Show and Fall Festival were both AWESOME!!! We were thrilled to once again host the International Harvester Collectors. Please visit our Facebook page for pictures and details. Copies of the IHC panorama photo are $35 and may be purchased from Kevin Kirkwood at 785-220-9477. Please see our Facebook page for pictures. Our 36th Annual Threshing and Antique Tractor Show (2012) was great fun! Pictures are up on our Facebook page, check us out there to upload your pics from the show. Learn how we cut and bind the wheat for our show! Our 2011 Summer show was HOT but fun! In addition to the International Harvester Collector's hosting their meeting with us in July 2010, Ag Am in Kansas featured our summer show on their daily program. View the June 7 segment. Welcome to Cottonwood Station, a reproduction living history of an early day Kansas town. Developed and maintained by the Meriden Antique Engine and Threshers Association (MAETA), established in 1977. Our purpose is to preserve, through living history, early farming techniques, the appreciation of antique engines, occupations and cultures in small towns and rural areas of early Kansas. We are pleased to offer private tours of our grounds year-round. Please contact Merril Lovendahl at (785) 986-6469 for appointments and information. If you would like to host an event on our grounds, please contact Jody Kirkwood at (785) 484-3713. Meetings are at 7pm the 4th Sunday of every month (except December) in the General Store. Please note: beginning in 2014, membership dues are going up to $20 for members age 12 and over. The Meriden Antique Engine and Threshers Association is a non-profit entity under the 501(c)(3) statute.